Artists Bill Orr and Maury Hurt. 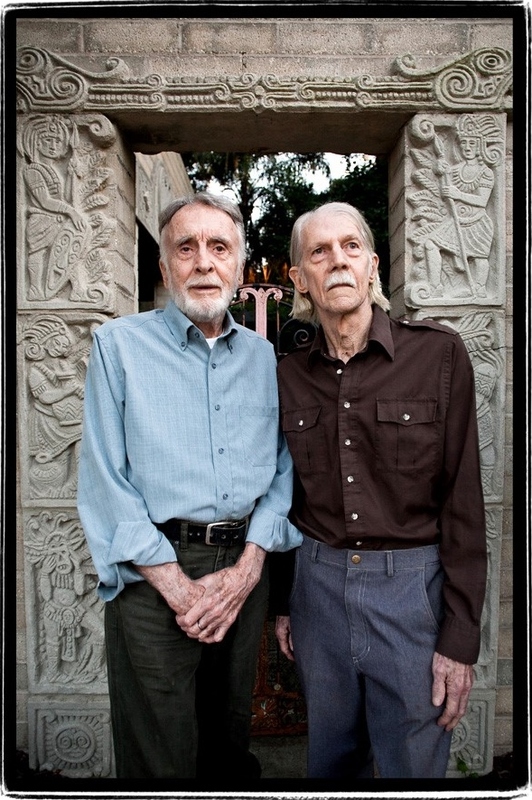 Both painters were instrumental in leading the movement to save the Maitland Art Center in Maitland, Florida, from developers in the 1960s. Bill Orr (1925-), photographed on the left, grew up in Michigan, where he worked breaking in mustang ponies. When World War II broke out, Orr joined the U.S. Army and was a member of the cavalry regiment. Later seeing action on Okinawa in the Pacific Theater, he was among the first servicemen to serve in Japan after the war. Orr found his way to the Research Studio in 1961 after applying for a position through a newspaper advertisement. As an artist, Orr made a living doing life-size portraits of horses. He would go on to establish himself as a leading equine artist, a tribute to his lifetime love of horses. 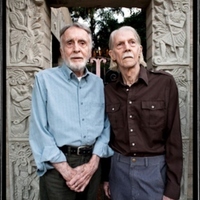 Orlando native Maury Hurt (1934-2013), photographed on the right, graduated from the University of Florida with a design degree in 1956. After serving a short tour in the U.S. Army, Hurt continued to work in the graphic arts fields for several years before abandoning the profession to become a full-time painter. From a studio at the Art & History Museums' Maitland Art Center, Hurt’s work centered on primitive and archaic themes often focusing on the relationship of humans, animals, and early prehistoric life. Hurst's legacy lies in his masterful work and is mentorship of artists across Central Florida. Original color photograph by Rob Bartlett: Orlando Weekly, Orlando, Florida. Digital reproduction of original color photograph by Rob Bartlett: Orlando Weekly, Orlando, Florida. Originally created by Rob Bartlett and published by Orlando Weekly. Copyright to this resource is held by Orlando Weekly and is provided here by RICHES of Central Florida for educational purposes only. Hoffman, Dean A. "Bill Orr: Canvassing the harness world." United States Trotting Association, April 27, 2011. http://xwebapp.ustrotting.com/absolutenm/templates/article.aspx?articleid=42115&zoneid=38. Bartlett, Rob. “Bill Orr and Maury Hurt.” RICHES of Central Florida accessed April 22, 2019, https://richesmi.cah.ucf.edu/omeka/items/show/5520.